, a learned English divine, was born at Padstow, in Cornwall, May 3, 1648. He was the son of Edmund Prideaux, esq. of an ancient and honourable family in that county, and was equally well descended by his mother, the daughter of John Moyle, esq. of Bake, in Cornwall. After some elementary education at Liskard and Bodmin, he was placed under Dr. Busby, at Westminster-school, and in 1668 admitted a student of Christ Church, Oxford, by dean Fell. His attainments here must have distinguished him very early: for we find that in 1672, when he took his bachelor’s degree, Dr. Fell employed him to add some notes to an edition of Florus, then printing at the university press: and soon after, he was requested to be the editor of Malela, a Greek historian, from a ms. in the Bodleian library but having represented this as a work not worth the printing, being fabulous and trifling, the design was laid aside, until Dr. Hody, who was of a different opinion, undertook the task. Mr. Prideaux, about the same time, was employed in giving a history of the Arundelian marbles, with a comment, which was published in May 1676, under the title *' Marmora Oxoniensia,“folio. Such a work was well calculated to advance his reputation abroad, as well as at home; and there was such a demand for it, that within a few years it could not be procured but at a very high price. It suffered, however, very much from the carelessness and neglect of a Mr. Bennet, then corrector to the university press, and contained so many typographical errors, that Mr. Prideaux never could speak of it with complacency. A more correct edition was published by Maittaire, in 1732. In 1675 Mr. Prideaux took his degree of M. A. | Having, by order, presented one of the copies of the” Marmora“to the lord chancellor Finch, this introduced him to his lordship’s patronage, who soon after placed one of his sons under him, as tutor at Christ Church and in 1679 presented him to the rectory of St. Clement’s, in the suburb of Oxford, where he officiated for several years. 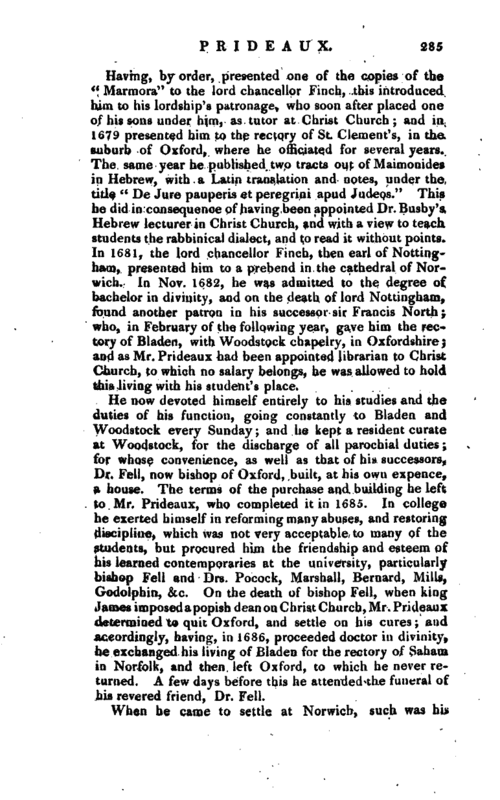 The same year he published two tracts out of Maimonides in Hebrew, with a Latin translation and notes, under the title ec De Jure pauperis et peregrini apud Judeos.” This he did in consequence of having been appointed Dr. Busby’s Hebrew lecturer in Christ Church, and with a view to teach students the rabbinical dialect, and to read it without points. In 1681, the lord chancellor Finch, then earl of Nottingham, presented him to a prebend in the cathedral of- Norwich. In Nov. 1682, he was admitted to the degree of bachelor in divinity, and on the death of lord Nottingham, found another patron in his successor sir Francis North; who, in February of the following year, gave him the rectory of Bladen, with Woodstock chapelry, in Oxfordshire; and as Mr. Prideaux had been appointed librarian to Christ Church, to which no salary belongs, he was allowed to hold this living with his student’s place. 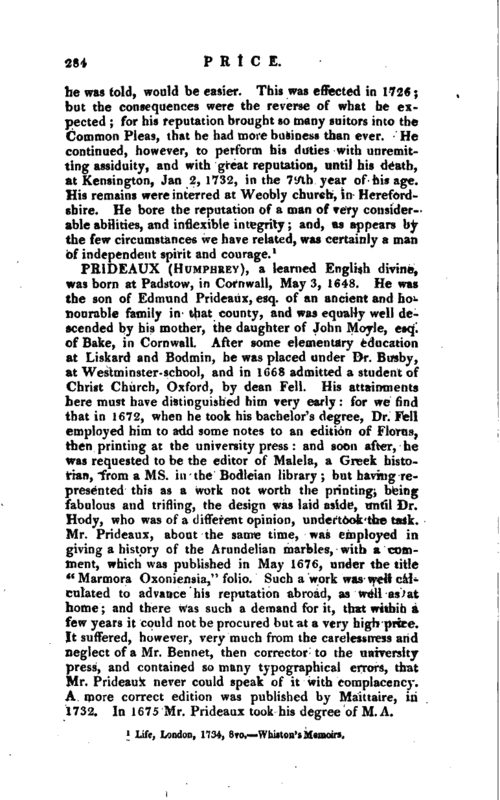 He now devoted himself entirely to his studies and the duties of his function, going constantly to Bladen and Woodstock every Sunday; and he kept a resident curate at Woodstock, for the discharge of all parochial duties; for whose convenience, as well as that of his successors, Dr. Fell, now bishop of Oxford, built, at his own expence, a house. The terms of the purchase and building he left to Mr. Prideaux, who completed it in 1685. In college he exerted himself in reforming many abuses, and restoring discipline, which was not very acceptable to many of "the students, but procured him the friendship and esteem of his learned contemporaries at the university, particularly bishop Fell and Drs. Pocock, Marshall, Bernard, Mills, Godolphin, &c. On the death of bishop Fell, when king James imposed a popish dean on Christ Church, Mr. Prideaux determined to quit Oxford, and settle on his cures; and accordingly, having, in 1686, proceeded doctor in divinity, he exchanged his living of Bladen for the rectory of Saham. in Norfolk, and then left Oxford, to which he never returned. A few days before this he attended the funeral of his revered friend, Dr. Fell. When he came to settle at Norwich, such was his | reputation for judgment and integrity, that the whole management of the affairs of the cathedral was committed to him, and throughout life he was concerned in placing them in a much better situation than he found them, great irregularities having prevailed in the keeping of the accounts, and the registers and other documents belonging to the church being much neglected. All these he sought out, examined, and arranged in a proper manner; and ordered, from time, to time, some very necessary repairs in the church. He was also, soon after his arrival here, engaged in a controversy with the popish party, whose emissaries, taking encouragement from the conduct of king James II. were now more than usually industrious. 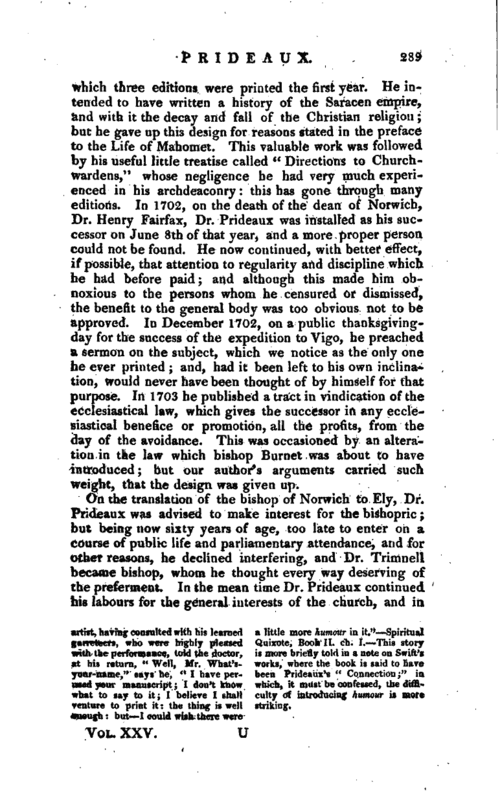 Those who had visited Norfolk, particularly, insisted on the invalidity of the orders of the church of England “for, having no priesthood, we could have no sacraments, and consequently could be no church nor could salvation be had among us.” In reply to this, Dr. Prideaux published a work entitled “The Validity of the Orders of the Church of England made out against the objections of the papists in several letters to a gentleman of Norwich, &c.” 1688, 8vo reprinted in 1715. He also preached in the cathedral against several of the tenets of popery, at a time when many of his brethren were intimidated by the determination of the king to establish that religion. One good effect of this was, that his brethren caught a portion of his spirit, and handled the same subjects in their respective churches; and, by other seasonable measures, the mischief was delayed until the abdication of the king; and the consequent proceedings upon that important event dispelled the fears of the friends of the protestant religion. In December of this year (1688) Dr. Prideaux was collated to the archdeaconry of Suffolk by Dr. William Lloyd, bishop of Norwich. In May 1689 he made his first visitation of his archdeaconry; and the new oaths to government being then the general subject of debate among the clergy, his chief business was to give the best satisfaction he could to those who had any doubts about them which he performed with such success, that out of three hundred parishes, there were only three clergymen in all that jurisdiction who refused to take them, In the winter following he attended the convocation, which was called to consider of alterations and amendments of the liturgy, the canons, ordinances, and constitutions, the reformation of the | ecclesiastical courts, &c. &c. but, after sitting ten days, no progress was made in any of these measures, and the convocation was. adjourned. Dr. Prideaux, who was of opinion that many alterations in the liturgy were necessary, wrote a pamphlet on the subject, entitled “ALetter to a Friend, relating to the present Convocation at Westminster,” of which several thousands were sold within a fortnight. 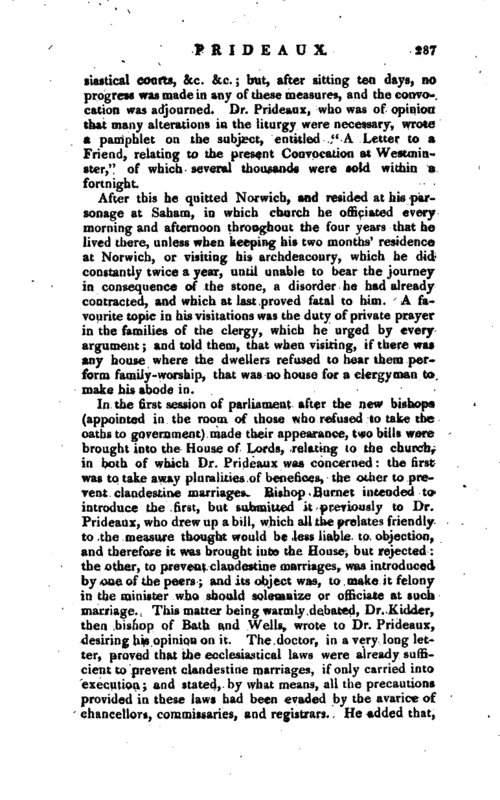 After this he quitted Norwich, and resided at his parsonage at Sahara, in which church he officiated every morning and afternoon throughout the four years that he lived there, unless when keeping his two months’ residence at Norwich, or, visiting his archdeaconry, which he did constantly twice a year, until unable to bear the journey in consequence of the stone, a disorder he had already contracted, and which at last proved fatal to him. A favourite topic in his visitations was the duty of private prayer in the families of the clergy, which he urged by every argument and told them, that when visiting, if there was any house where the dwellers refused to hear them perform family-worship, that was no house for a clergyman to make his abode in. In the first session of parliament after the new bishops (appointed in the room of those who refused to take the oaths to government) made their appearance, two bills were brought into the House of Lords, relating to the church, in both of which Dr. Prideaux was concerned the first was to take away pluralities of benefices, the other to prevent clandestine marriages. Bishop Burnet intended to introduce the first, but submitted it previously to Dr, Prideaux, who drew up a bill, which all the prelates friendly to the measure thought would be less liable to objection, and therefore it was brought into the House, but rejected the other, to prevent clandestine marriages, was introduced by one of the peers and its object was, to make it felony in the minister who should solemnize or officiate at such marriage. This matter being warmly debated, Dr. Kidder, then bishop of Bath and Wells, wrote to Dr. Prideaux, desiring his opinion on it. The doctor, in a very long letter, proved that the ecclesiastical laws were already sufficient to prevent clandestine marriages, if only carried into execution and stated, by what means, all the precautions provided in these laws had been evaded by the avarice of chancellors, comnjissaries, and registrars. He added that, | as the bill stood, it could have no other effect than to subject the clergy to be tried for their lives every marriage they solemnized. Kidder, who had made vise of this paper in the debate which ended in withdrawing the bill, immediately. 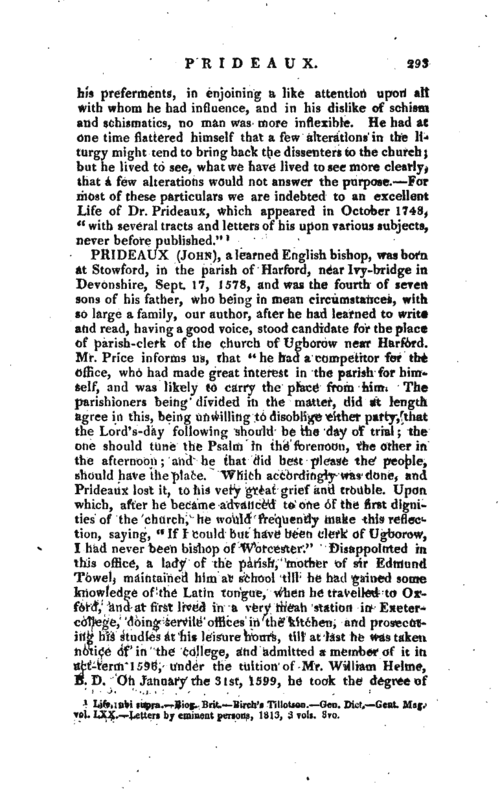 sent it to the press; and the week following, to Dr. Prideaux’s great surprize, he received a printed copy of it from the bishop, who however had not put his name to it. In 1696, the dean and chapter presented him to the vicarage of Trowse, worth about 40l. and situated a mile from Norwich. Here he officiated with the same assiduity and regularity as at Saham, and that purely for the love of duty for, in addition to his other preferments, he had a private fortune, which rendered this last vicarage of no consequence in a pecuniary view. artist, having consulted with his learned garreteers, who were highly pleased with the performance, told the doctor, at his return, “Well, Mr. What’syour-name,” says he, “I have perused your manuscript; I don’t know what to say to it; I believe I shall venture to print it; the thing is well enough but I could wish there were a little more humour in it.” Spiritual Quixote, Book II. ch. I. This story is more briefly told in a note on Swift’s works, where the book is said to have been Prideaux’s “Connection;” in which, it must be confessed, the difficulty of introducing humour is more striking. | which three editions were printed the first year. He intended to have written a history of the Saracen empire, and with it the decay and fall of the Christian religion but he gave up this design for reasons stated in the preface to the Life of Mahomet. This valuable work was followed by his useful little treatise called “Directions to Churchwardens,” whose negligence he had very much experienced in his archdeaconry this has gone through many editions. 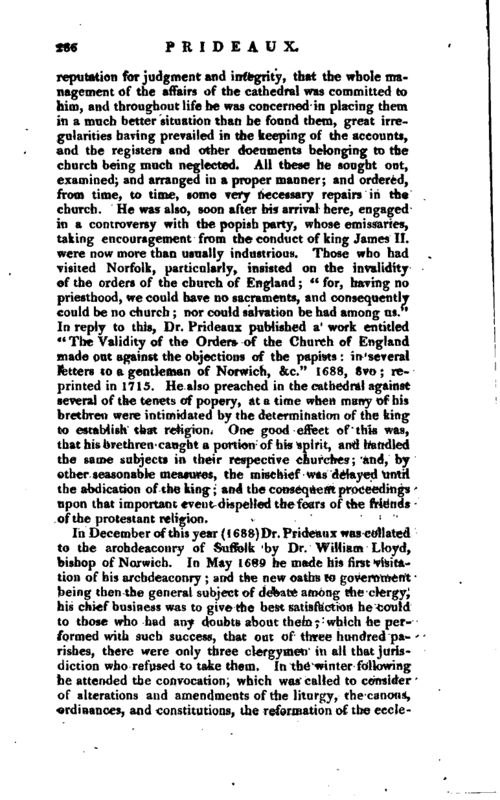 In 1702, on the death of the dean of Norwich, Dr. Henry Fairfax, Dr. Prideaux was installed as his successor on June 8th of that year, and a more proper person could not be found. He now continued, with better effect, if possible, that attention to regularity and discipline which he had before paid and although this made him obnoxious to the persons whom he censured or dismissed, the benefit to the general body was too obvious not to be approved. In December 1702, on a public thanksgivingday for the success of the expedition to Vigo, he preached a sermon on the subject, which we notice as the only one he ever printed and, had it been left to his own inclination, would never have been thought of by himself for that purpose. In 1703 he published a tract in vindication of the ecclesiastical law, which gives the successor in any ecclesiastical benefice or promotion, all the profits, from the day of the avoidance. This was occasioned by an alteration in the law which bishop Burnet was about to have introduced; but our author’s arguments carried such weight, that the design was given up. 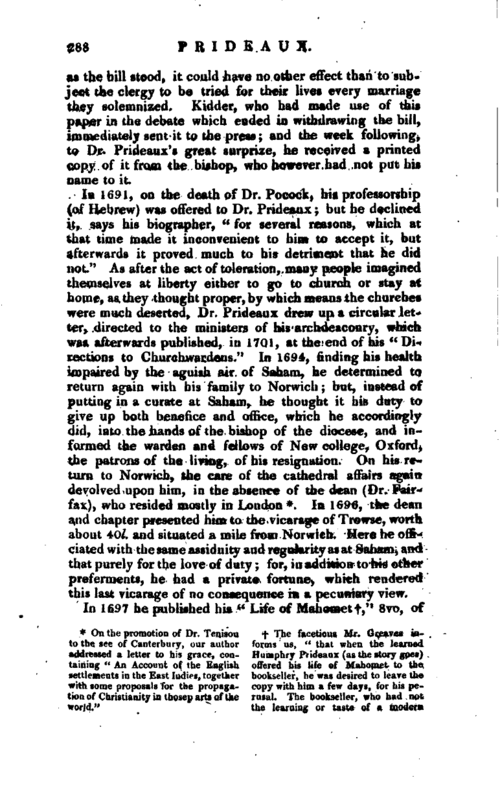 On the translation of the bishop of Norwich to Ely, Dr. Prideaux was advised to make interest for the bishopric but being now sixty years of age, too late to enter on a course of public life and parliamentary attendance, and for other reasons, he declined interfering, and Dr. Trimnell became bishop, whom he thought every way deserving of the preferment. In the mean time Dr. Prideaux continued his labours for the general interests of the church, and in | 1709, published his tract on “The original right of Tythes.” In this, his first intention was to give the History of Appropriations and this was to have been only an introduction but it enlarging under his hand, he resolved to publish it by itself as the first part of the work. 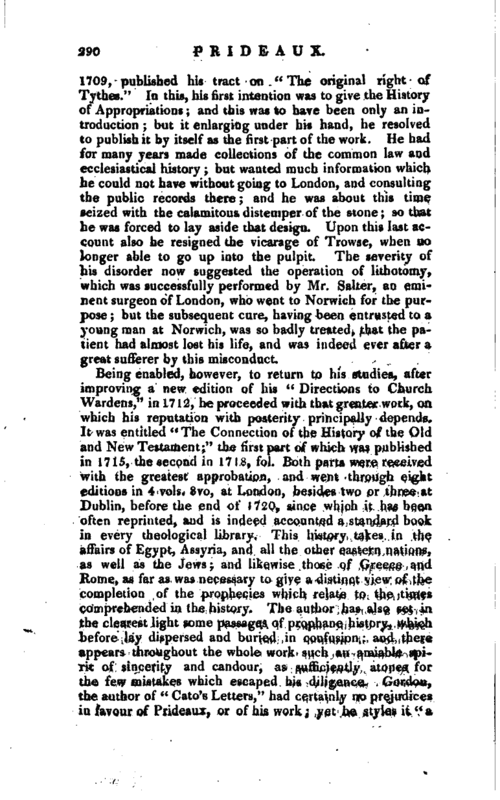 He had for many years made collections of the common law and ecclesiastical history; but wanted much information which he could not have without going to London, and consulting the public records there and he was about this time seized with the calamitous distemper of the stone; so that he was forced to lay aside that design. Upon this last account also he resigned the vicarage of Trowse, when no longer able to go up into the pulpit. 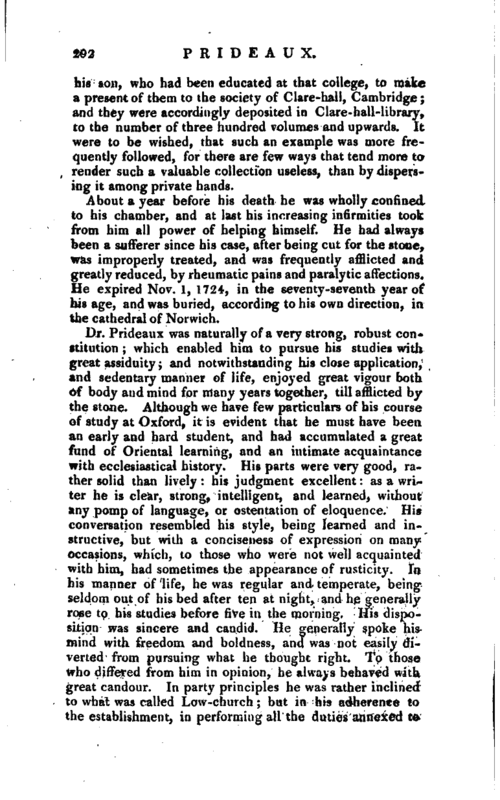 The seventy of his disorder now suggested the operation of lithotomy, which was successfully performed by Mr. Salter, an enii* nent surgeon of London, who went to Norwich for the purpose but the subsequent cure, having been entrusted to a young man at Norwich, was so badlyareated, that the patient had almost lost his life, and was indeed ever after a great sufferer by this misconduct. Being enabled, however, to return to his studies, after improving a new edition of his “Directions to Church Wardens,” in 1712> he proceeded with that greater work, on which his reputation with posterity principally depends. It was entitled “The Connection of the History of the Old and New Testament;” the first part of which was published in 1715, -the second in 17 1, foL Both parts were received with the greatest approbation, and went through eight editions in 4 vols. 8vo, at London, besides two or three at Dublin, before the end of 1720, since which it has been often reprinted, and is indeed accounted a standard book in every theological library. This history takes in the affairs of Egypt, Assyria, and all the other eastern nations, as well as the Jews and likewise those of Greece and Rome, as far as was necessary to give a distinct view of the completion of the prophecies which relate to the times comprehended in the history. The author has also set in the clearest light some passages of prophane history, which before lay dispersed and buried in confusion and there appears throughout the whole work such an amiable spirit of sincerity and candour, as sufficiently atones for the few mistakes which escaped his diligence. Gordon, the author of “Cato’s Letters,” had certainly no prejudices in favour of Prideaux, or of his work yet he styles it “a | body of universal history, written with such capacity, accuracy, industry, and honesty, as make it one of the best books that ever came into the world, and shew him to be one of the greatest men in it. No book was ever more universally read and approved it is, indeed, a great public service done to mankind, and entities the author to the highest public gratitude and honour. But though I never saw any great work, to which 1 found fewer objections, yet as a memorable proof how inseparably mistakes and prejudices cleave to the mind of man, the great and candid Dr. Prideaux is not without them. I therefore do not upbraid him with them, but rather admire him for having so few. There are, however, some of his theological observations, which seem to me not only ill-grounded, but to have a tendency to create in his readers wrong notions of the Deity, and to encourage them to mistake the common accidents of life, and the common events of nature, for judgments 4 and to apply them superstitiously as such.” There are letters between the dean, and his cousin Mr. Moyie, concerning some passages in this “Connection,” &c. printed in the “Miscellaneous Works” of the latter, and in Dr. Prideaux’s life. No man could be more willing to listen to reasonable objections, or to correct what could be proved to be wrong. Candour was the distinguishing feature of Dean Prideaux’s character. 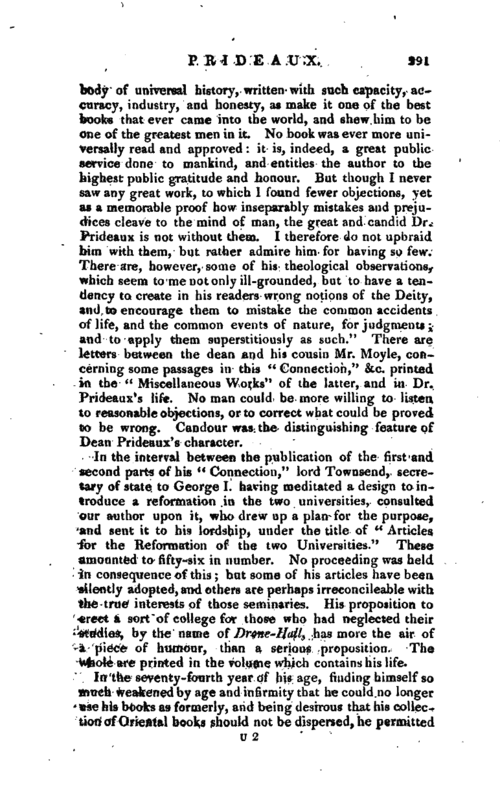 In the interval between the publication of the first and second parts of his “Connection,” lord Townsend, secretary of state to George I. having meditated a design to introduce a reformation in the two universities, consulted our author upon it, who drew up a plan for the purpose, and sent it to his lordship, under the title of “Articles for the Reformation of the- two Universities.” These amounted to fifty-six in number. No proceeding was held in consequence of this but some of his articles have bee.n silently adopted, and others are perhaps irreconcileable with the true interests of those seminaries. His proposition to erect a sort of college for those who had neglected their studies, by the name of Drone-Hall, has more the air of a piece of humour, than a serious proposition. The whole are printed in the volume which contains his life. In the seventy-fourth year of his age, finding himself so much weakened by age and infirmity that he could no longer use his books as formerly, and being desirous that his collection of Oriental books should not be dispersed, he permitted | his son, who had been educated at that college, to make a present of them to the society of Clare-hall, Cambridge; and they were accordingly deposited in Clare-hall-library, to the number of three hundred volumes and upwards. It were to be wished, that such an example was more frequently followed, for there are few ways that tend more to render such a valuable collection useless, than by dispersing it among private hands. About a year before his death he was wholly confined to his chamber, and at last his increasing infirmities took from him all power of helping himself. He had always been a sufferer since his case, after being cut for the stone, was improperly treated, and was frequently afflicted and greatly reduced, by rheumatic pains and paralytic affections. He expired Nov. 1, 1724, in the seventy-seventh year of his age, and was buried, according to his own direction, inthe cathedral of Norwich. 1 Life, ubi supra.Biog. Brit. Birch’s Tillotson. Gen. Dict. —Gent. Mag. vol. LXX. Letters by eminent persons, 1813, 3 vols. 8vo.